Back in January, Meg Bate, our Assistant Librarian provided an update on this blog about the new genealogical material that had been added to the GSV's digitised databases. This work has continued with the good work done by our volunteers and the latest material to be added is listed below. It may just contain that missing piece of your family history jigsaw. Maldon State School No. 1254 pupil register pt 2 August 1873 - December 1891. For a list of previously added material you can check back on this Blog under 'In the Library' or 'Archives' to see if there is something in the GSV's Collection that may help your research. 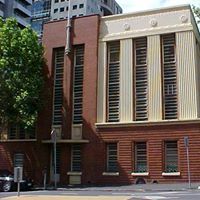 Royal Historical Society of Victoria is at 239 A’Beckett Street, Melbourne. The entrance to the RHSV is in A'Beckett St.
Take Tram 55 up William Street, and get off at the LaTrobe Street stop. There are also frequent buses up Queen St from GSV to A'Beckett St, but it is only a 10-15 minute walk from the GSV. Take a train to Flagstaff Station, and walk one short block up William St to A'Beckett St. In this opening article for 2018, Meg Bate, GSV's Assistant Library Manager, gives an update on the recent additions to the unique GSV Cemeteries Database. Outtrim cemetery register and headstones 3.1897 - 15.4.1946. Genealogical Index of Names (GIN), containing about 4 million references to people mentioned in our library and elsewhere, is available for members only. GIN comprises the LINX databases held in our library, some with images. However, not all entries are included in GIN for copyright or commercial reasons. Data is added regularly. Members may use our free Quick look-up to obtain further details in many cases. A fee for a Quick look-up is charged for non-members. Maddingley cemetery register 23/4/1863 - 14/11/1958. Note: if the library catalogue location states: 'CEMETERIES DATABASE' - The images are attached to records in the Cemeteries database and may be viewed online. 'INDEXED IN CEMETERIES DATABASE' - The cemetery had been indexed and our scanned document is only available at the GSV. Check the instructions on the catalogue. 13 April 2017 - This post commences a new category which we hope keeps you better informed about the resources in our Library that may help you with your family history research. Articles of broad interest in recently received periodicals are highlighted quarterly in GSV's Ancestor journal in the regular column, 'Jottings...and library news'. Members receive this journal as part of their membership. tracing ancestors - Irish, Huguenot, Royal Navy, and Army, as well articles on the '1939 register', on places and families in Buckinghamshire and another containing a good introduction to the enclosure of shared strips of land after 1773. Ancestry's indexing of 'Ireland School Masters and Mistresses 1826', British Army pension records, pensioners records of the Royal Hospital Kilmainham 1724-1924, Royal Hospital Chelsea 1715-1925 and Pensioner Soldier Records 1760-1920.
an interesting article about un-named death records held by the various Australian State registries. The NSW records have over 3000 records for 'Unknown'. useful tips in 'Some of our ancestors are missing' (Buckinghamshire). You can follow up these in our catalogue - online before your visit.